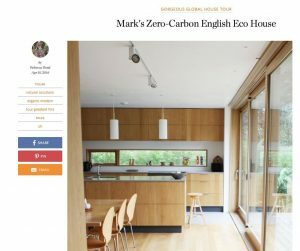 ‘Mark’s Zero-Carbon English Eco House’ in Apartment Therapy, April 2016. We’ve had a lovely in-depth feature of our zero-carbon house and office at Lloyd Close, Hove, by blogger Rebecca Bond, including original photos and an interview with our director Mark. Screenshot from the article on Apartment Therapy. You can click here to view the full article on the Apartment Therapy Blog. And you get download an in-depth case study of the featured project and how it generates all it’s own clean energy, when you sign up to our free monthly Eco Design Newsletter.